John Gorka has no problem with being labeled a folk singer, a title that was once synonymous with "obscure" and "unfashionable." The guitar-playing baritone is proud of his musical heritage and while he has found himself in the media spotlight with increasing frequency, he remains committed to his long-time fans and his established way of working. "My approach has always been low-key, song-driven, touring-based, slow, steady growth," the singer/songwriter said in a press release. Gorka is not interested in trading this formula for a spot on the pop or country charts; he is more interested in building a long career, rather than sparking a brief period of stardom. Because Gorka feels that his sustained success as a musician is dependent on his live performances, he spends over 150 nights on the road each year and continues to play in the small folk clubs where he made his name. Gorka told Billboard: "Quite honestly, I will sing for anyone who has an interest in my music. But I don't think a little interest from one part of the world will make me reposition my musical direction. Any changes or growth has to happen naturally, otherwise it won't work." In 1991 Rolling Stone's Eliza Wing called Gorka "the preeminent male singer-songwriter of what's been dubbed the New Folk Movement." The artist later responded to this compliment in a cynical fashion in The Performing Songwriter: "I thought it was a double oxymoron....New/Folk and Folk/Movement. As far as I know, folk music has always been here, never gone away." While folk recordings may now be selling in increased numbers, including Gorka's own, he knows that he and many of his colleagues have been faithful to the genre all along. Gorka began his career during the late 1970s and early 1980s, when only a handful of small labels were making folk records. He started performing while he was in college at the Bethlehem, Pennsylvania folk club, Godfrey Daniels. At first, the young man tended bar and sang on open-mike nights; later he lead the Razzy Dazzy Spasm Band. Moreover, Gorka listened to and carefully studied the performers who headlined there. Eventually he came to know these musicians when he became an opening act. Singer Nanci Griffith first suggested that Gorka enter a contest to play at the 1984 Kerrville Folk Festival in Texas, where he not only performed, but won the show's New Folk Award. His first big break, the award gave a boost to Gorka's visibility and confidence. Gorka's first album came three years later, when the small Minnesota label Red House Records released I Know. The success of this album and the praise of fellow artists soon led to a multi- album deal with a "major league" company, Windham Hill, as well as its subsidiary High Street Records. Gorka had to convince the company that they shouldn't re-record I Know, as was prescribed by company founder William Ackerman. Gorka remembered in The Performing Songwriter, "I was ready to turn the deal down, because I felt like I couldn't do this to the people who bought the first album. It may not be the biggest audience in the world, but it's the only one I have. I didn't want to betray them in order to get some mysterious larger audience they told me was out there." Both parties compromised, resulting in Land of the Bottom Line, which included two "bonus tracks" from the earlier album. With the increased promotion and distribution power of Windham Hill, Gorka's singing and songwriting abilities reached new ears and attracted increased critical attention. Robert Gluck remarked in the New York Times that the album "made its way...past the small public radio station and cult audiences familiar with [Gorka's] earlier music to commercial airwaves and larger audiences." Steven Rea praised Land of the Bottom Line in the Philadelphia Inquirer: "What strikes you first about Gorka's music is his voice: a warm, resonant baritone that both demands your attention and rewards it. It is unforced, plaintive, clear....the songs keen along on catchy, straightforward melodies, and while a good many are tales of broken hearts or broken men, they are laced with irony." Gorka's next two albums, Jack's Crows and Temporary Road, reflected a happier, less introspective man (he explained in interviews that he had fallen in love). Jack's Crows was notable for the attention it received by country radio and video programs; Temporary Road showed Gorka's capacity for political commentary in songs such as "The Gypsy Life" and "Brown Shirt," which reflected his thoughts, respectively, on the Gulf War and fascism. Temporary Road, as well as Gorka's subsequent albums Out of the Valley and Between Five and Seven, are also remarkable for their supporting cast of big-name recording artists. The roster includes Cliff Eberhardt, Nanci Griffith, Kathy Mattea, Mary Chapin- Carpenter, Leo Kottke, and Peter Ostroushko, among a sea of others. Gorka has toured and recorded with an impressive number of folk- country-pop stars that are not only colleagues, but friends. These relationships are part of a nurturing network that helped him start his career and has greatly influenced his on-going work. Gorka notes that this approach is a throwback to less competitive times; he told The Press of Atlantic City, New Jersey that "there was not really a whole lot of commercial potential for the music...We all wanted to make a living....There was a lot of camaraderie." In addition to these links to the folk scene, Gorka has also been an important source of songs for singers Maura O'Connell and and Mary Black, who are among some 20 artists who perform covers of his compositions. A veteran of many live performances, and an outspoken songwriter, Gorka is ironically a shy, quiet man in person. Gorka has explained that he communicates best through his music, and that he began songwriting to overcome the difficulties he had with the spoken word. He told Rolling Stone: "I can organize my thoughts better and present what I really want to say....I get my best ideas waking in the morning or going to sleep. The lines that seem to ring true come then. Whenever I learn something I put it into a song." Gorka has also carefully studied his favorite performers, searching for the secret of a good "stage presence." He has concluded that it boils down to being honest, being yourself. And so, John Gorka has developed a quietly confident, very funny onstage presence. Robert P. Gluck described his impact thus: "Whether it's playing without amplification before a small group, or before a crowd at the country's largest gathering of folk artists, the Philadelphia Folk Festival, Mr. Gorka mesmerizes. His brand of humor makes listeners laugh from the gut, taking the bitter edge off his biting, poignant song-poems." With this approach, Gorka hopes to keep entertaining audiences for a long time. In 2008, Gorka decided to return to Europe for the first time in fourteen years. In October, he played four times in the Netherlands, he played live on VPRO radio and he did a session for the John Gorka video site.In 2009, Gorka toured in the USA but also in Ireland and the Netherlands. In October, Red House Records released the CD "So Dark You See." Gorka's latest installment is considered a more intimate, vocal and guitar-centered record than the last two. 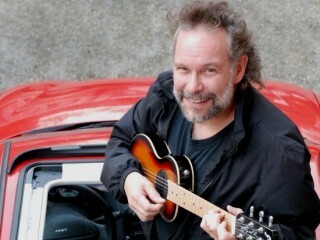 View the full website biography of John Gorka.